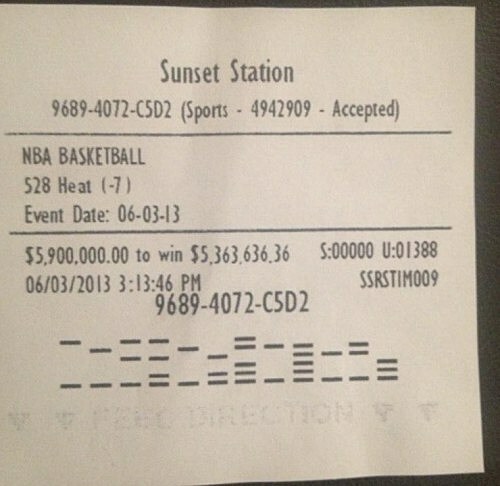 Did Floyd Mayweather Place a $5.9 Million Bet on the Miami Heat and Win? So the rumors and pictures are circulating around the internet that Professional Boxer Floyd Mayweather placed a bet of $5.9 million last night on the Miami Heat to pull off the win against the Indiana Pacers and they did, which makes Mayweather even richer than he already was. Mayweather known for making large bets on professional games and also known for always carrying around $1 miilion in cash with him at all times is said to of placed the bet at the Sunset Station in Las Vegas according to the ticket circulating the internet. So the question is did he actually place the bet? Or is it all just an insane prank to get people talking about Mayweather since he's currently not fighting and out of the limelight? Mayweather's next scheduled fight is on September 14th, 2013 vs. Canelo Alvarez.